I keep half of my computer repair tools on a USB Flash Drive (the other half I keep on bootable CDs). I found myself often losing the flash drives or otherwise destroying them in my pockets. I came up with a great way to make a cheap (or free!) holder for these keys out of things you should have around the house anyways. You could even use it to hold other USB dongles you frequently work with, such as a USB bluetooth or wifi dongle. Any USB cable with a female end on it. I just cut mine off the USB extender cable that came with my flash drive. 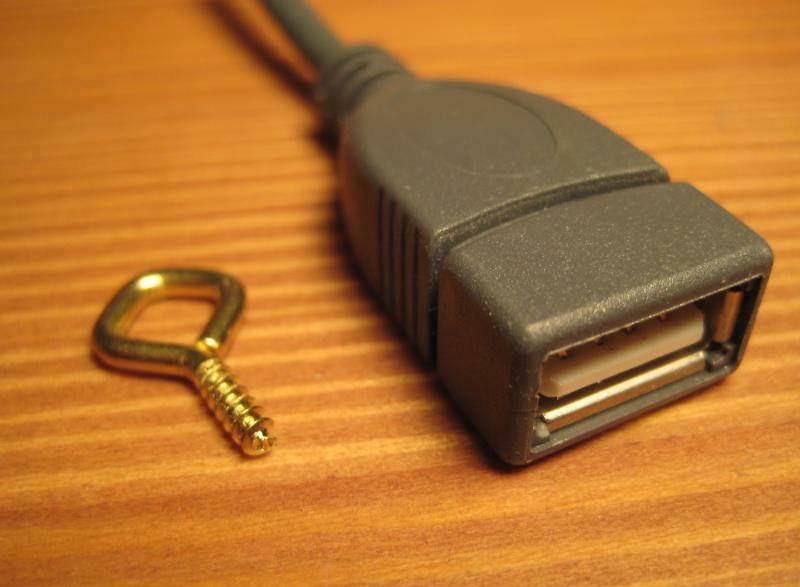 Most flash drives come with these extender cables, so being a packrat, I naturally had dozens of them. Eyelet. I’m not even sure if this is the right term for this little screw. I got mine from a half-used picture frame hanging kit. You should be able to find them otherwise at any craft or hardware store. Click the link below to catch the rest of the instructions after the fold!